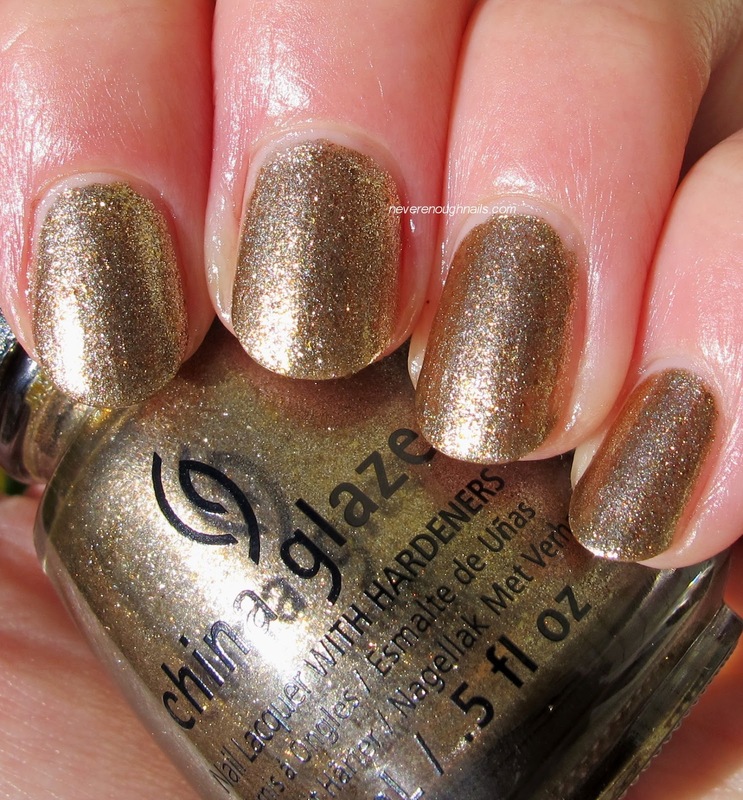 The China Glaze Autumn Nights collection for Fall 2013 offers a mix of jewel-toned shimmers and metallic foils and feels nicely fall-like. The weather is just starting to get cool here, so I'm finally more enthusiastic about fall colors. I have two of my picks from the Autumn Nights collection for you today, all swatches are with one coat of Essie Good to Go on top. China Glaze Goldie But Goodie is a gold foil with some coppery flecks scattered throughout. China Glaze calls it an "eternal rust gold shimmer", LOL, what exactly is eternal rust? Death for C-3PO? Goldie But Goodie attracted my attention when I saw people saying it was a one coater. A one coat gold foil would be the star of my holiday nail looks, so I had to check it out. I definitely think I would wear this at one coat, but I ended up doing two coats for the pictures. It's very richly pigmented, but my camera tends to pick apart foils. The formula was really nice, absolutely no complaints! If you already own a hundred gold foils (me), you might still want this one because of it's opacity. Gold foils are common, but one coater gold foils are much less so. 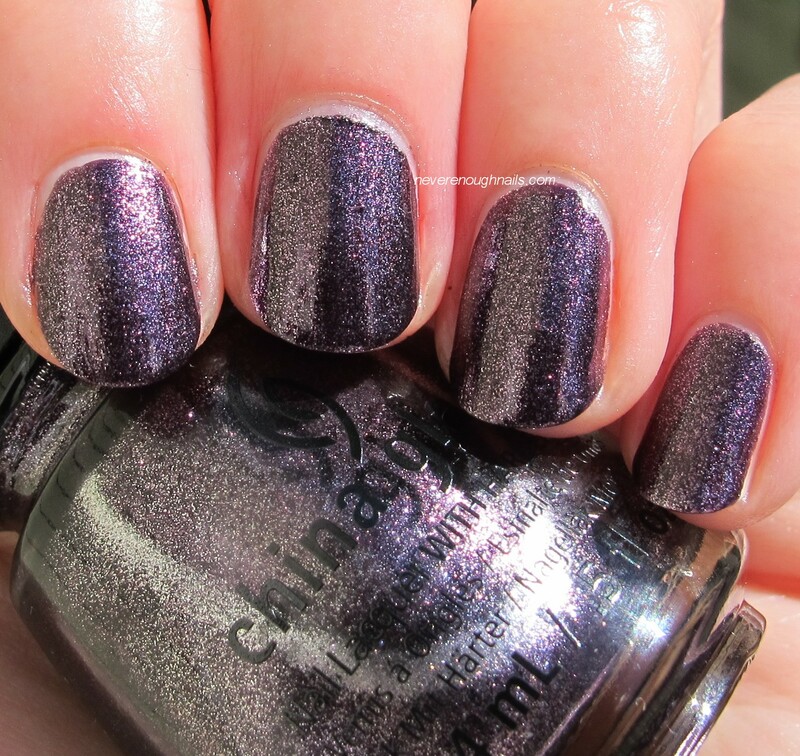 China Glaze Rendevous With You is a dark shimmery purple foil. I always enjoy purple and I do not own any dark purple foils! Rendevous With You is very shimmery in direct sunlight and has a cool particle-y look in natural light (see the last two pictures). It's the kind of polish that you feel like you can see each individual shimmer. Rendevous With You had the same great formula as Goldie But Goodie- excellent! This is definitely a one coater! I even did one coat for the pictures. 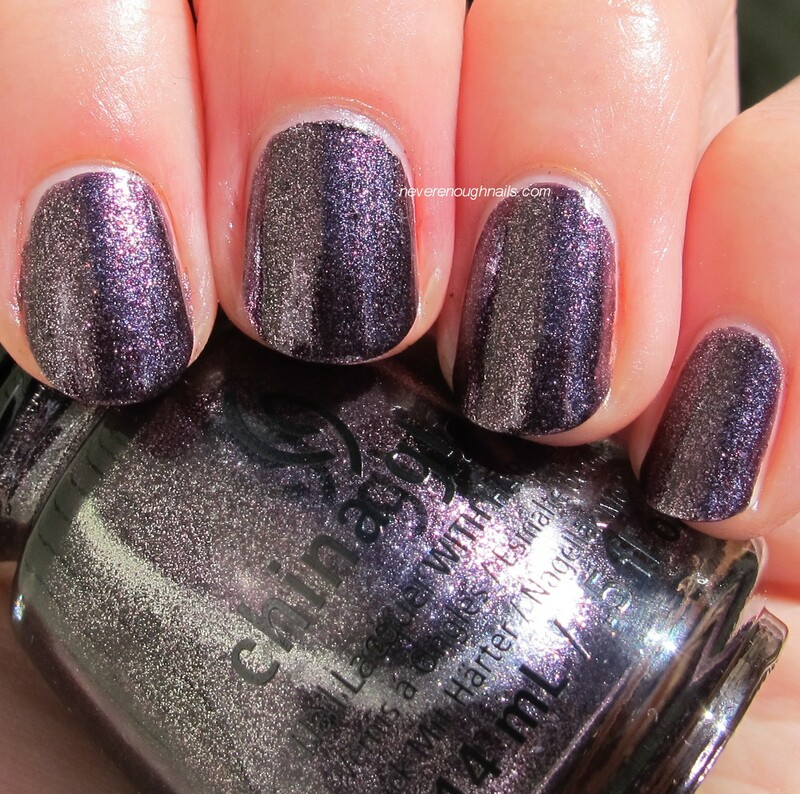 Great opacity, not like some foils that you think will be opaque and then end up needing four coats. Both of these polishes will be in heavy rotation for me this fall (and holiday season for Goldie). I am thinking about getting the rose gold foil, Strike Up a Cosmo, as well. If it's as opaque as these two, I think it would be a good addition to my polish wardrobe. I'll have swatches of my other two Autumn Nights picks in a day or so! 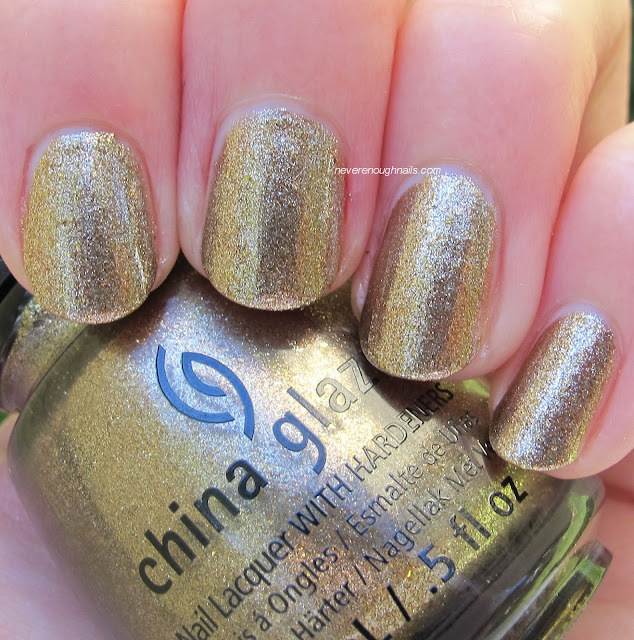 Do you have your eye on any of the fall China Glaze lacquers? The China Glaze Autumn Nights collection is available now at salons and professional beauty supply stores nationwide. For more information, please visit www.chinaglaze.com or follow China Glaze on Facebook (@ChinaGlazeOfficial), Twitter (@ChinaGlaze) and Pinterest (pinterest.com/chinaglaze). Wow, I wasn't planning to pick up anything from this collection--just not that jazzed--but you've sold me on Goldie But Goodie. It's gorgeous! I really love it Elizabeth! I'm so impressed with the pigmentation too! I like them a lot Kimberly! Especially the pigmentation! I like a good complicated 7 layer mani as much as the next nail fanatic, but sometimes it's nice to slap one coat on and go.